Non-skiers are headed to the mountains this season, and they’re ready for their own winter fun. One in five non-skiing travelers still take ski and snowboard vacations on occasion with family and friends who enjoy the sport, according to a recent study conducted by Wyndham Vacation Rentals, the world’s largest professional manager of vacation rentals and part of the Wyndham Worldwide family of brands (NYSE: WYN). More and more U.S. ski resorts are enhancing the destination experience for skiers and non-skiers alike. Olympic gold-medalist and ski racer, Picabo Street, who has been on the mountains all her life, has seen the changes first-hand. 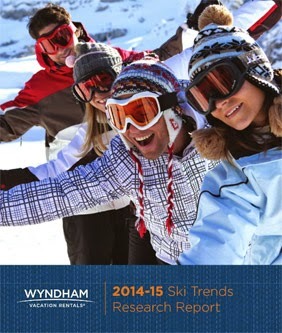 The Wyndham Vacation Rentals® study’s full findings are captured in the 2014-15 Ski Trends Research Report, which explores today’s ski and winter vacations. The findings reflect data collected from more than 11,000 travelers, including skiers, snowboarders, and non-skiers. They want to be dined. 90% of non-skiers find dining very to extremely appealing when taking a ski/snowboard vacation with family and friends. They enjoy the snow, too. Non-skiers don’t avoid the snow. 57% find other outdoor activities like dog sledding, snowshoeing and snow tubing very to extremely appealing while on a ski/snowboard vacation. They hit the town. Ski towns are a hot spot for non-skiers on vacation. They find the area’s arts and entertainment (68%) and shopping (64%) very to extremely appealing. They’re ready to relax. Nearly twice as many non-skiers find an on-site spa very to extremely appealing compared to skiers and snowboarders (42% to 22%). Non-skiers also find a pool/hot tub more appealing (74% to 62%). They crave comfort and convenience. Nearly twice as many non-skiers feel privacy is extremely important on a ski/snowboard vacation compared to skiers (44% vs. 23%). They also place more value on the extras that may be available with their vacation rental. 39% of non-skiers found concierge services very to extremely important compared to 24% of skiers.